Runners are held at the starting line. FARCE ENSUED IN Sheffield this morning as a half marathon was cancelled minutes before the starters’ gun was set to blast. 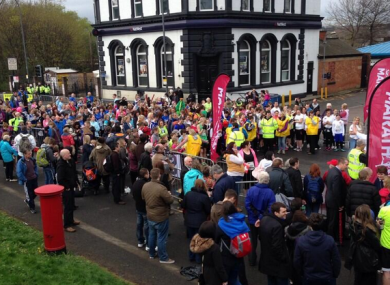 The Sheffield Half Marathon was called off minutes before the off due to ‘insufficient water supplies’. More than 6,000 runners were lined up for the start of the annual event when organisers opted to pull the plug. The decision caused much consternation before many people decided to set off. It has been reported by BBC Radio Sheffield that some 5,000 people chose to run, regardless of the water supplies. Local police them attempted to set up road blocks to dissuade the runners from completing the 13.1 mile course. As of 10:50am, many runners are still making their way through the course in the city and are being cheered on by members of the public. Joe Wooding, in Sheffield, took this picture of one man who has taken it upon himself to hydrate as many ‘unofficial’ participants as possible. Email “Farcical scenes in Sheffield as half marathon is cancelled due to lack of water”. Feedback on “Farcical scenes in Sheffield as half marathon is cancelled due to lack of water”.